The band Dub Apocalypse consists of Tommy B (John Browns Body),Timo Shanko (G Love & Special Sauce), Dana Colley (Morphine), Ken Clark (Ken Clark Trio), Johnny Trama (Nate Wilson Group, B3 Kings, Peter Prince & the Trama unit). 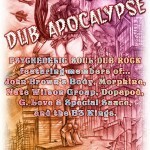 2011's winners of the Boston Music Awards category for Best International Artist of the Year is the dub reggae ensemble Dub Apocalypse. This group is a little bit elusive, in that they don’t have a concrete web page up for view, but don’t let that fool you one bit! They are beyond the shadow of a doubt, a first-rate world music ensemble, winning over audiences wherever they perform.